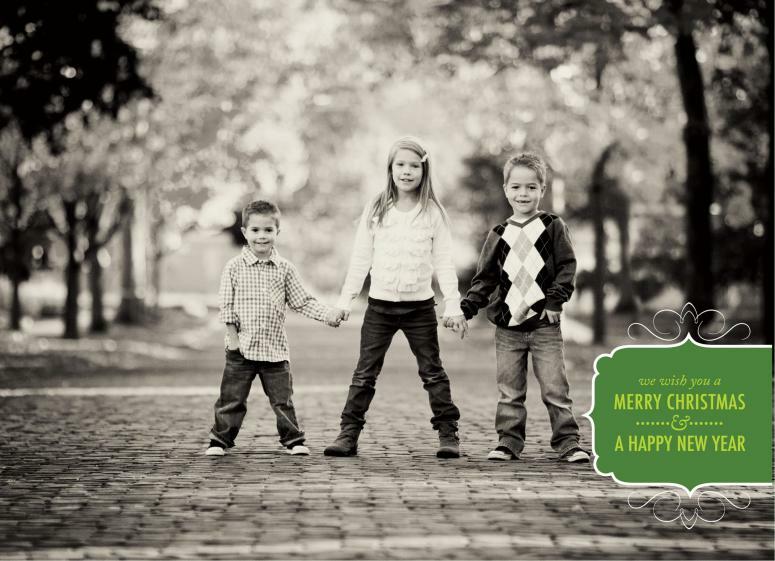 Snaz up those plain ol' Christmas cards! I am a Christmas card junkie. There. I said it. I've outed myself. I love Christmas cards. And by love, I mean obsess over. I start thinking about cards long before Thanksgiving...and I have a HORRIBLE/WONDERFUL time choosing which styles to order...this year I surfed the net for 3 days before I even narrowed down the sites I wanted to order from. And then...as if that wasn't enough...after I had already decided which cards to order, my girl Jamielyn from I Heart Naptime told me about Paper Coterie and I had to start all over (in this case, that was a good thing...Paper Coterie is da bomb). I finally decided on 5 different card styles...yes...5. I ended up ordering 20 each (or approximately) of the 5 different designs...is that weird? from Paper Coterie - this one actually comes with scalloped edges...love. I also have one more that I ordered from Snapfish, but I was having trouble with their site, so I can't show you a before (frowny face)... and I was too lazy to actually walk over to the scanner and scan one...(another frowny face). And here's the last one...from Snapfish...just your plain jane 4x8 photo card. I wrapped a piece of Tim Holtz glassine kraft paper around the card (after I'd embossed it with a snowflake) and attached the edges in the back with a Christmas sticker...voila. I especially like the look of these cards because I think the kraft glassine looks like leather...ooooh. There you have it! 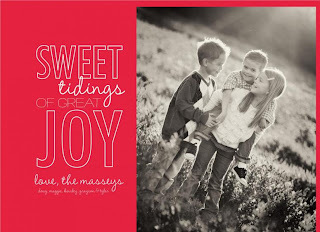 With just a few embellishments and a couple of nights in front of the TV, my Chrismtas cards are just a touch more "me." I plan on sending my cards on December 1...is this too early? Too late? What's your opinion? Wow these are fantastic! I am totally going to steal your idea this year!! I still need to take the kiddos pictures though. Okay I'm jealous! I wish I had fabulous photos of the kids like you have! They all look so wonderful, I'd buy a bunch of different ones to. I haven't started mine yet so I know I'll be late, but awesome job on yours! I ordered 2 sets! Wish I would have seen this prior to mailing 'em! That's genius! I love how you jazzed these up. I would have never thought to do that. I may have to borrow some of your ideas. Know what I hate the most? Just a picture, no message, no christmas letter, just the picture. I think if one of those "just picture" cards came jazzed up like this, I would like it a TON better. Can't wait to order ours now and jazz it up. Very pretty on the card additions! I've been debating when to send ours as well. I think I'll wait until next week... But no, I don't think December 1st is too early. They look so much more special with the way you personalized them! How adorable! The pictures are fantastic, and I love your little add-ons! I think the doily addition is my favorite--makes me think of snowflakes :-) Great work! This is absolutely genius. I make my cards every year and while I love doing it, it is quite time consuming. So your idea just revolutionized the way I think about Christmas cards. Thank you!! @courtney Thank you so so much, Courtney! I tried making my cards once...once. You are awesome for doing it every year!!! These are beautiful! I LOVE the shape of the cards! I was probably going to order the same one from Shutterfly, but now I have to check out MORE options! Thanks for the inspiration of JAZZING them up! pinned this! Love your ides, your cards are awesome! I'm so behind in this regard...need to get my cards made asap! THEN SNAZ them up like you did! Your cards are adorable, and I love your added touches! Ahh Maggie I feel your pain, trying to decide on one now! Love the embellishments!!! 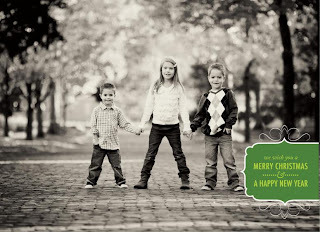 The photos are just gorgeous...such cute kiddos!!! Wow! You do love Christms cards! The embellishments are all beautiful! I'm sure your friends and family will be thrilled!